Saturday’s competition was a classic sprint race for all age groups. 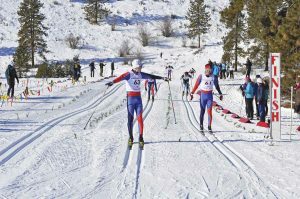 In a variation of the normal sprint format, a king’s court bracket system was used so that all skiers were able to race in all four heats (qualifier, quarterfinal, semifinal and final), Hall said. 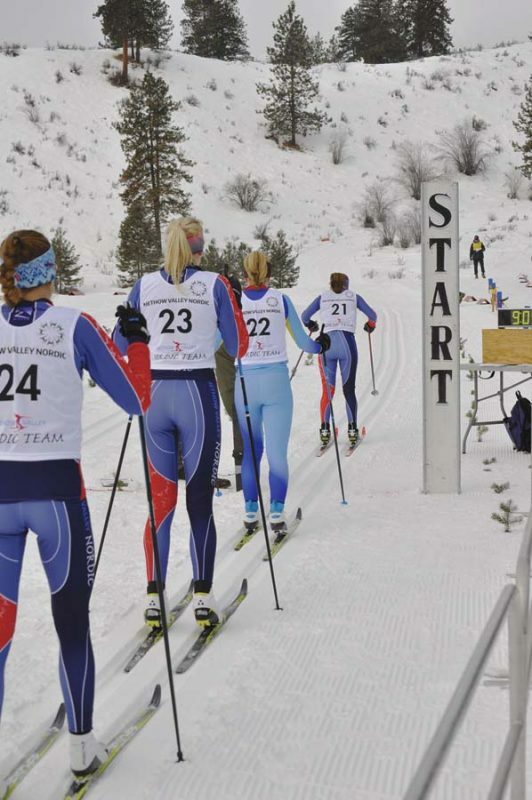 The skiers ran an individual start qualifier on the 1.1-kilometer course, ranked against each other in two different age groups (14-year-olds on up and 13-year-olds on down, skiing a 900-meter course). After the older skier qualifier races, MVNT was in great position with six girls in the top bracket and four boys in the top bracket. After the finals, skiers were sorted into age classes for the placement awards, Hall reported. Walker Hall, No. 63, and Garrett Butts, No. 61, were first and second in the U18/20 men’s classic sprint. For the U18/20 men, Walker Hall and Garrett Butts went one-two with Travis Grialou in fourth. In the U16 boys’ race, Bodhi Kuzyk won easily (placing third in the boys’ final overall), Cooper Legler was 17th and Alex Tareski 19th. In the U18/20 women’s race, there was a Methow Valley sweep with Novie McCabe winning, Ella-Sophie Kuzyk in second, Greta Laesch in third, Hadassah Lurbur in fourth and Gretta Scholz in sixth. The U16 girls also swept the podium with Jori Grialou on top, Eva Weymuller in second and Lilia Kuzyk in third, followed by Keeley Brooks fifth, Mariah Lucy sixth, Wyatt Albright ninth, Mahali Kuzyk 14tjh, Lena Nelson 16th and Amelia Bondi 23rd. “We also had a great group of younger skiers participating in the 900-meter sprint which ended up with these results” Hall said: Dexter Delany eighth in the U14 boys; Dashe McCabe second, Stella Scholz third and Leki Albright fourth in the U14 girls; Marit Nelson won the U12 girls, followed by Marta Schkrohowsky in second and Josie Bolinger in seventh. Neva Clark channeled Wonder Woman. In the U12 boys’ race, Ben Kaufman was third, Emmet Bondi fifth, Ely Talbert eighth and Emil Schkrohowsky ninth. In the U10 class, Wylie Smith won for the girls, with Sisu Clark in second. For the boys, Cooper Buzzard was second, Sam Polson third and Sam Kaltenbach fifth. 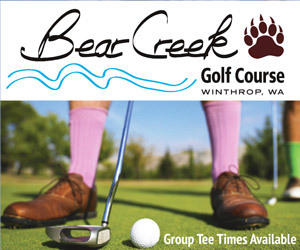 Results can be found on webscorer.com for Feb. 2 races. Laura McCabe was kept busy on the waxing bench. 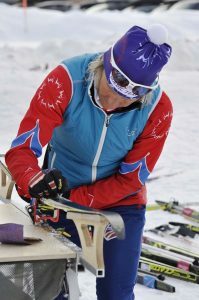 “It was a hectic day of waxing for the coaches and there was great community volunteer support to make the event run smoothly,” Hall said. Mass start skate races were set for Sunday (Feb. 3), with the older boys getting the best conditions for their 10K race, Hall said. Walker Hall and Garrett Butts battled it out again with Walker taking the win in the U18/20 class. 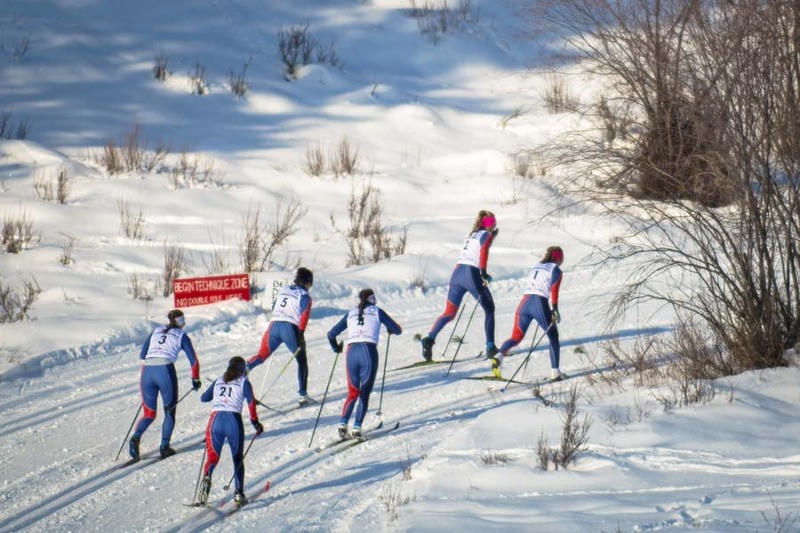 In the U18/20 women’s 10K mass start, Novie McCabe left the field behind and won by nearly 2 minutes over her teammates, who again swept the podium: Ella-Sophie Kuzyk second, Hadassah Lurbur third and Greta Laesch in fifth. The U16 skiers raced the 5K loop with Bodhi Kuzyk battling for first place in the boys’ race and taking the victory in the finish lanes, followed by Alex Tareski in 14th and Cooper Legler in 15th. MVNT’s Keeley Brooks, No. 24, Eva Weymuller, No. 23, and Jordan Grialou, No. 21, competed in the classic sprint. The U16 girls were again strong with Jori Grialou winning, followed by Eva Weymuller in second and Lilia Kuzyk in third, Hall reported. Keeley Brooks outsprinted a Spokane skier for fourth, Mahali Kuzyk was sixth, Mariah Lucy seventh, Wyatt Albright 14th, Lena Nelson 17th and Amelia Bondi 25th. The U14 skiers raced a 3.5K loop with boys and girls combined for the race, but separated for the results. Dashe McCabe won the girls’ race with Leki Albright taking second and Stella Scholz third. Dexter Delaney was third in the U14 boys’ field. 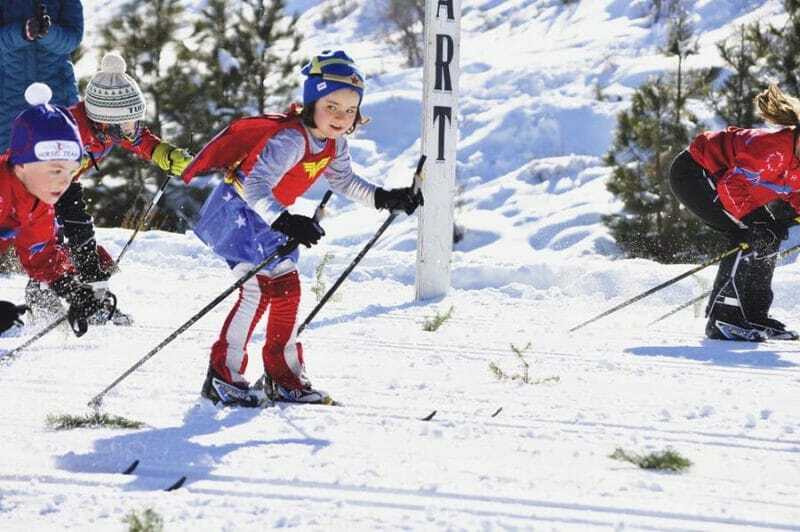 Several younger skiers opted to join the U12 2.5K race, making for a bigger and more challenging event, Hall said. Ben Kaufman fought his way from starting at the back to third place, followed by Emmet Bondi in fifth, Sam Polson in seventh and Ely Talbert in ninth. Marit Nelson again won the girls’ U12 race, with Sisu Clark in fifth, Wylie Smith sixth, Josie Bolinger eighth, Maeve Belsby ninth and Mira Hirsch 10th. Sawyer DeSalvo, Sam Kaltenbach and Jude Polson went two-three-four in the U10 boys, with Madison Williams third in the U10 girls’ class. Sunday’s results can all be found here at www.webscorer.com/race?raceid=168521.